–H.P. Lovecraft, "The Nameless City"
You swore that you would never go back. Yet like a snake eating its own tail, you were always meant to return to where it all began. 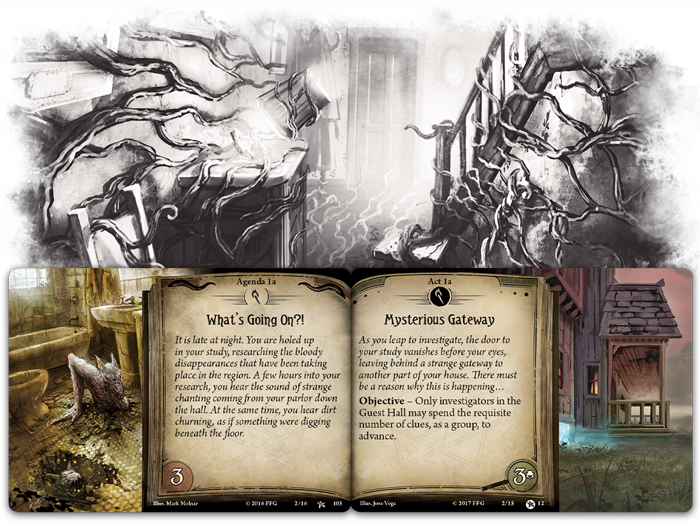 In the Arkham Horror: The Card Game Core Set, the Night of the Zealot campaign presented your first challenge while introducing you to the investigators, mechanics, and environment of Arkham Horror Files, providing a stable foundation from which you built your investigations out into the unknown and the unknowable. Now, you are invited to return home and begin a new challenge worthy of your expertise. 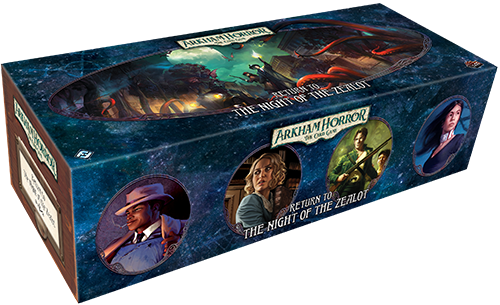 Fantasy Flight Games is proud to announce Return to the Night of the Zealot, an upgrade expansion for the Night of the Zealot campaign from the Arkham Horror: The Card Game Core Set, now available for pre-order at your local retailer or online through our website here! Arkham Horror: The Card Game is a cooperative card game in which one to four players take on the roles of investigators attempting to solve eldritch mysteries while confronting maddening horrors in the world of H.P. Lovecraft's Cthulhu mythos. Now, in Return to the Night of the Zealot, you'll find an assortment of new content for the classic Night of the Zealot campaign from the Core Set, inviting you and your team to play through the investigation once more while experiencing enhanced challenges and new boons with sixty-six new cards, split between scenario cards, encounter cards, and player cards. This expansion also provides a storage solution with a premium box and eighteen divider cards to house your complete Night of the Zealot campaign in one place. During your first excursion into Lovecraftian horror in the Night of the Zealot, you watched the world you thought you knew fall away as Ghouls and Cultists invaded your home, your safe haven. Ultimately, you were forced to leave the comfort of your own ignorance behind. Since then, your investigations into the paranormal and the macabre have led you across the globe into dangerous realms that run parallel to our own and pushed you within an inch of your life and your sanity. Now, after all you’ve seen, all you’ve learned, the circle has led you back to the beginning, where a new level of horror awaits. In Return to the Night of the Zealot, the stars may have aligned to open a door to your past, but things are not precisely as they were. The evils you defeated once have become stronger. It seems if they have been lying in wait for this moment to occur, to get another shot at destroying you, and this time they are not alone. 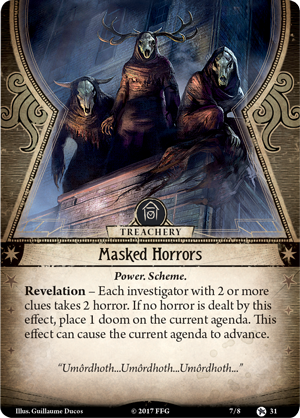 This upgrade expansion features new scenario cards for each of the three scenarios in the campaign: now marked as Return to The Gathering, Return to The Midnight Masks, and Return to The Devourer Below. While these titles may sound like a resurgence of the familiar, the experience is anything but. Return to the Night of the Zealot also stacks your encounter deck with two new encounter sets, filled with monsters and treacheries more terrifying than any you have faced. Ghouls from the Ghouls encounter set are replaced by Ghouls of Umôrdhoth and Cultists who once belonged to a Dark Cult now align with The Devourer’s Cult. You are far from defenseless in your battle against these newfound horrors, however. 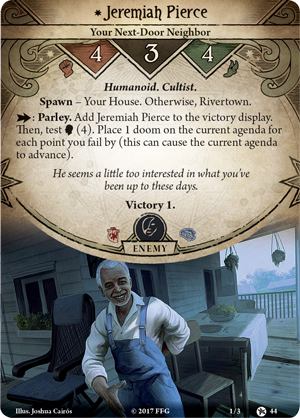 Your time as an investigator in Arkham Horror: The Card Game has increased your experience and taken you to the far corners of the globe, providing you with ample opportunity to hone your skills and find stronger implements to add to your arsenal. This expansion features several new player cards—upgraded versions of cards that you originally found in the Core Set. 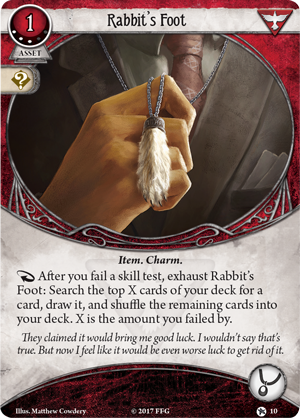 For example, your lucky Charm, the Rabbit's Foot (Return to the Night of the Zealot, 10), now returns with an upgraded ability. While in the original Core Set, you could exhaust Rabbit's Foot (Core Set, 75) to draw a card after a failed skill test, this new version lets you exhaust the card after a failed skill test to search a number of cards equal to amount you failed by and add one of them to your hand. This added ability to search for exactly what you need can prove invaluable, as you will need every weapon and tool at your disposal if you wish to solve the mystery and escape with your life. In addition to this enhanced mystery, Return to the Night of the Zealot includes a premium box that can be used to store your entire Night of the Zealot campaign, along with divider cards marked for each encounter set in Night of the Zealot. Within this hallowed repository, you will find the sixty-six new scenario, encounter, and player cards, as well as a list of achievements that can create the ultimate challenge as you play Return to the Night of the Zealot. 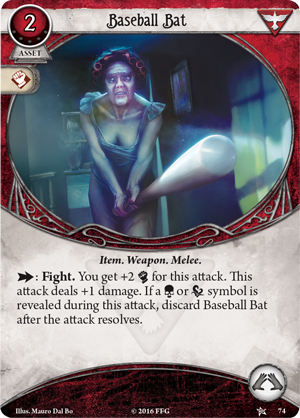 For example, you may favor the Baseball Bat (Core Set, 74) as your weapon of choice and become a Pinch Hitter, defeating three Ghouls without the Baseball Bat breaking. Another achievement may require each member of your team to stay in your cursed house for three rounds despite all logic, forcing you to question …But Do I Have To? As you explore these new ways to experience investigations, you must proceed with caution. The closer you get to answers, the more exposed you become to the threats lurking in the shadows of Arkham. Masked Horrors (Return to the Night of the Zealot, 31) haunt the streets, and danger can hide behind even a friendly face. Lately, you’ve notice that your neighbor Jeremiah Pierce (Return to the Night of the Zealot, 44) has been a little too interested in what you’ve been up to, namely your investigation. To evade his constant, needling questions will take a true test of your Willpower. With every slip, Jeremiah gets a new piece of information that he can pass along, adding one doom to the agenda for every failed point. Do you have what it takes to outsmart the cunning Cultists, or will you fall victim to whatever malevolent force drew you back in the first place? Your investigations have brought you so far, but there was never any hope for escape. You need to return and face your demons. Perhaps it would be easier to just surrender to the madness, yet despite the increased danger, you cannot—will not—allow Arkham to fall into darkness. Gather your courage, assemble your team, and return to Night of the Zealot!